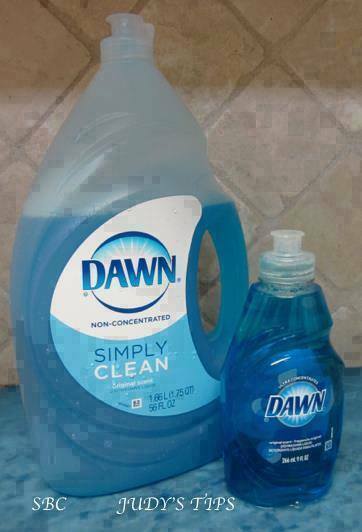 Ever wonder why Dawn Dishwashing Liquid is the wildlife cleaner of choice after an oil spill? According to the International Bird Rescue Research Center, Dawn effectively removes grease but does not cause harm to the skin of the birds. It’s also biodegradable and contains no phosphates. According to Bubbles.org, Dawn dishwashing liquid makes great homemade bubbles. Here is the Giant Bubble Recipe used in bubble makers at many children’s museums: 1/2 cup Ultra Dawn 1/2 gallon warm water 1 tablespoon glycerin (available at any drug store) OR White Karo syrup works too! Stir gently. Skim the foam off the top of the solution (too much foam breaks down the bubbles). Dip bubble wand and get ready for some good, clean fun! Kids get into the darnedest things! Like Vaseline and baby oil rubbed into their hair! Dawn is mild enough to use on their hair and strong enough to remove the most stubborn grease. Once a month use original Dawn as you would shampoo. It will remove excess oil from your hair and scalp and strip away any build-up of styling products without any damage. Perform this once a month and you won’t have to buy expensive salon products that do the same thing. Soak fingers in full-strength blue Dawn. It makes the cuticles soft and easy to work with. And it removes the natural oil from the fingernails, which allows the polish to adhere very well. A safe, effective way to repel insects from your houseplants, including aphids, spider mites and mealy bugs. Put a drop of Dawn Dishwashing Liquid in a spray bottle, fill the rest of the bottle with water, shake well, and mist your household plants with the soapy water. Try this recipe from Merry Maids: mix 3 drops Dawn in 1 gallon water and fill a spray bottle with the solution. Spritz and wipe as you would with any window cleaner. Use it to bathe the dogs. It kills fleas on contact and is much cheaper than expensive dogshampoos. After you have finished your automotive repair project, soak your dirty tools in Dawn before you put them away to remove all the oil and grime. Dawn also helps prevent rust from forming on the tools. Partially fill a strong zip-type sandwich bag with Dawn dishwashing liquid, close and freeze. The liquid soap stays cold much longer and it can be re-frozen many times. It will conform to the place you need an ice pack. Take a spray bottle and fill it halfway with white vinegar. Heat in the microwave. Fill the rest of the way with blue Dawn. Put lid on and shake to mix well. Spray on your tub and shower walls. Allow to sit for a few minutes and rinse away. It will totally melt all the gunk, slime, sludge and other stuff that builds up including a bathtub ring. Spray counter-tops, cupboards and any other area where you see ants with a solution of Dawn and water. Wipe dry. The slight residue of Dawn that remains will not be a problem at all for kids or pets, but ants hate it. Should you see a trail of ants, go ahead and hit them with the Dawn spray. Add a squirt or two of original Dawn dish soap to your washer and run a hot wash, then rinse until there are no more bubbles. Dawn is a degreasing agent and helps stripping by removing oily residue. Be sure to rinse, rinse, rinse until the water runs clear. Poison ivy spreads through the spread of the oil within the blisters. Washing the affected area with Dawn, especially on children who keep scratching the blister’s open, helps dry up the fluid, AND keep it from spreading. If you have gasoline or motor oil stains on your driveway, you can use the kitty litter method to clean up the excess oil and then use a scrub broom and a solution of biodegradable Dawn dishwashing detergent and warm water to safely and effectively remove excess motor oil from the pavement. Dawn makes a great facial cleanser for oily skin. A drop or two combined with warm water will do the trick. Dawn combined with corn oil makes for the perfect paint or grease remover. Simply combine a little bit of both in your hands then rub it over affected areas. The corn oil and the dishwashing liquid both help to dissolve the grease and paint – yet leave skin soft, unlike harsher paint removers. Plastic wading pools can get very gunky, very fast. Dump the water, then scrub the pool with Dawn and a sponge. More potent cleaners like bleach will weaken and dry out the plastic in the sun. • Bathroom and kitchen counters and sinks. • Tubs and toilet seats. For oil-based stains such as lipstick, grease, butter, motor oil, cooking oil, and some pen inks, simply apply some Dawn dishwashing liquid directly to the stain and scrub with a small brush or toothbrush until the oil is removed, and then launder as usual. Sliding glass doors, door knobs, hinges etc. It lasts much longer than any aerosol type spray that I have tried. And Its non-toxic! It does a great job of cleaning the parts that its lubricating as well! Squirt Dawn down the middle of the pool and all of the dirt, suntan lotion, etc. will move to the edges of the pool for easy clean up! AND it makes the pools sparkle. Simply rub a small drop of Dawn on eyeglass lenses, and wipe clean. It will leave a very thin film that will prevent them from fogging up. Cover greasy footprints on shower floors with a coating of Dawn; let sit overnight. Scrub away the gunk in the morning with a stiff brush. Mix two tablespoons Dawn to a gallon of water and put in your sprayer. Try to get spray both sides of the leaves, branches and the tree trunks. Let sit for about 15 minutes and then rinse the trees THOROUGHLY! Here’s a brilliant idea! Need a hostess gift when visiting friends and family this summer? Print off this post and include it with a bottle of Blue Dawn! Talk about USEFUL !